The following photos make up an album of one of the most celebrated constellations in the sky. 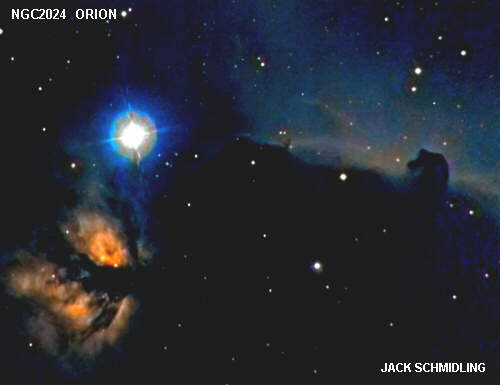 They were taken with several different telescopes and cameras. To locate Orion, face South as soon as it gets dark (late February) and it's unmistakable grouping of stars looks like this. 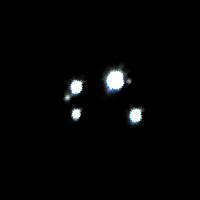 The 3 diagonal stars in the center represent the Hunter's belt and Zeta is the left most star. The 3 stars below the belt represent his sword and the middle one is surrounded by the Great Nebula. 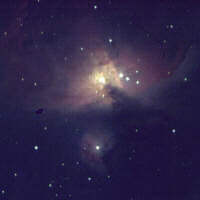 The Flame Nebula, NGC 2024 is the bright nebulosity at top, just left of Zeta Orionis. The Horse Head nebula is just below Zeta and M42 is near the bottom right. 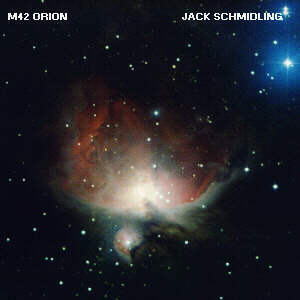 M42 looks a bit unusual because it is overexposed in order to render the Horse Head well. This photo was a 60 min exposure on hypered TechPan film through the 90mm Astrograph. 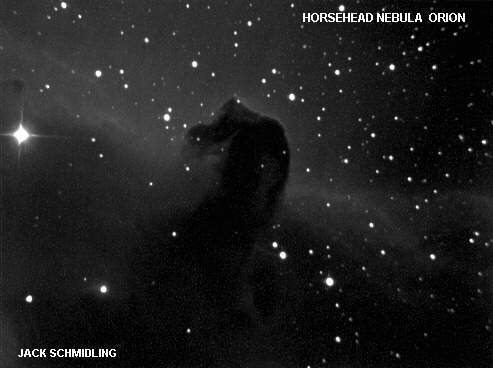 This is an enlargement of the above area showing the Fame Nebula and the Horse Head. This image was taken in hydrogen alpha light with green and blue filters supplying the other colors. It was taken with the 4.25" Astrograph. This image was a 10 min exposure with the MX716 through the 16" telescope. The color data for this image was extracted from NASA images and combined with the monochrome image above to produce a true color image "according to NASA". 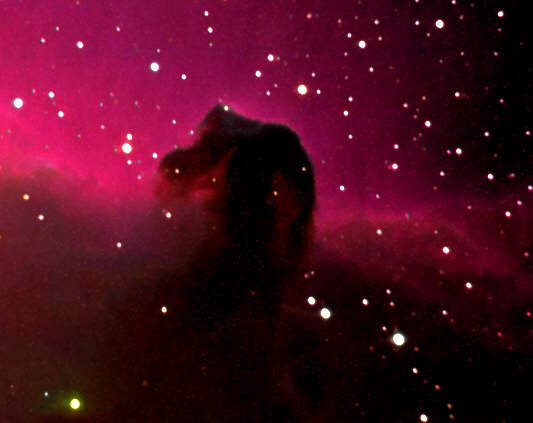 Unfortunately, the Horsehead is virtually impossible to see in even very large telescopes because of the weakness of the background nebulosity and the dazzling brightness of very close Zeta. This most interesting object had to wait for the invention of photography to become the most famous "dark nebula" in the sky. 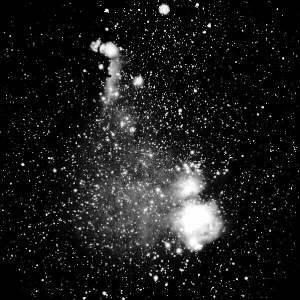 The reflection nebula NGC 2023 is about half a moon diameter NE of the Horsehead. It can be seen in the image of the Flame and Horsehead above. It is about an inch above and to the left of the Horsehead in that image. This image was a 15 min exposure with the MX5C with the 16" telescope. 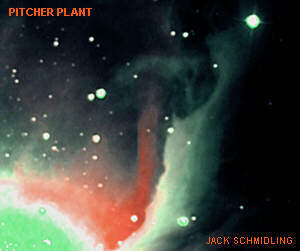 This is a higher resolution image of an interesting feature in the nebula which I have named the "Pitcher Plant". It was a 10 exposure with the MX5C. 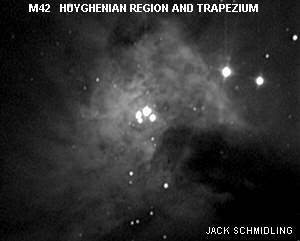 The Trapezium is probably the most famous multiple star system known. It consists of four widely spaced components that are easily resolved in anything larger than binoculars and several close companions that are difficult because they are overwhelmed by the other much brighter stars. 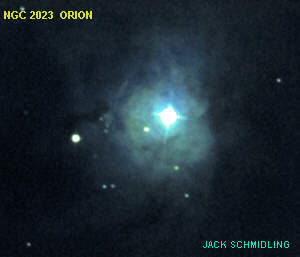 Although the Trapezium is much discussed and pointed to in photographs, it is rarely visible in those photos because they are usually taken to wow us with the grandeur of the Orion Nebula. In order to see the trapezium in photos, the exposures must be very short and taken with very long focal lengths. This series of images will take you from a large scale view which makes visible the so-called Huyghenian Region containing the Trapezium. This is roughly a rectangle with a dark bay just below Theta Orionis. Following this is a series of progressively higher resolution images and an identification chart. A short exposure to allow the Huyghenian Region to be seen. Theta is the bright blob just above the dark bay entering from the lower right. prime focus of the 10" Newt. This view is a CCD image which brings out the Huyghenian Region without losing the 4 stars of the Trapezium. This high resolution CCD image resolves the E and F components in addition to the four stars of the Trapezium. This was a 2 second exposure with the MX5 CCD camera and is at an EFL of 25 feet through the 16" telescope.